Game of Thrones Season 8: Jon Snow, Daenerys Targaryen and Cersei Lannister to Die? Peter Dinklage's Instagram Post is Causing Fans to Believe So! Game Of Thrones finale is only a few weeks away and it seems fans could make anything that they see relating to the show as a hint at what happens next. The latest example of this has been an Instagram post shared by actor Peter Dinklage who popularly plays the character of Tyrion Lannister in the series. 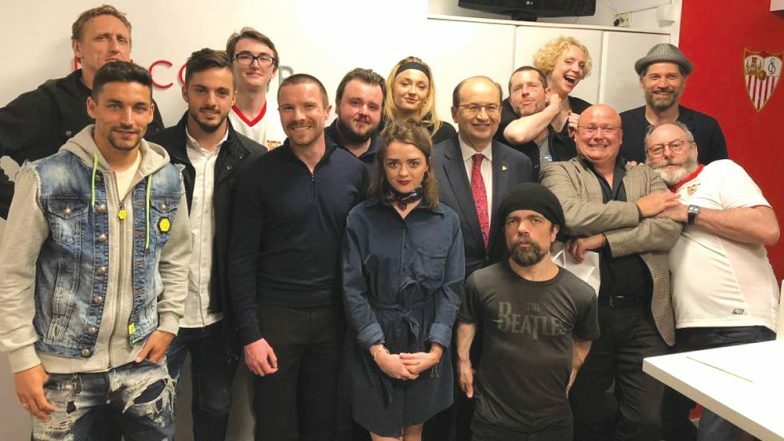 The actor randomly shared a picture of the cast of the Season 8 and while everyone was all smiles, fans noticed something rather odd in this picture. Well, it was mainly that actors Emilia Clarke, Kit Harrington and Lena Headey were missing in it. Apart from the trio, Peter was seen posing with almost everyone from those who have survived till the last season. This set the fans into wondering if it was a hint that the characters played by Lena, Emilia and Kit were going to be killed off early on in the show. No sooner did Peter post this picture, comments started flooding asking about the death of Jon Snow, Queen Cersei and Daenerys Targaryen. Game Of Thrones Season 8: Longest Episode of the Series Will Premiere On the Opening Weekend Of Avengers: Endgame. Well, we can keep guessing about what happens in the final season of the much-awaited series Game Of Thrones until we finally watch it. The HBO series will be premiering on April 14 and we are expecting some big surprises in the first episode itself.